Multitouch has been brought into the legal spotlight yet again. 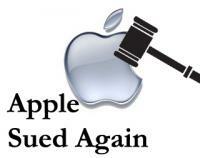 This time however, Apple is the one who's getting sued. Yep, in an ironic twist of fate, Elan Microelectronics is suing Apple for violating two of its touchscreen patents, after failing to reach a licensing agreement with them after 2 years of negotiations. Elan Microelectronics, a Taiwan-based company, is probably best known for producing the touchpads for a few of the Eee PC models. Back in 2006 they sued and won a preliminary injunction against Synaptics for one of the patents they're now suing Apple about. Synaptics countersued and just last year a cross-licensing deal was put in place. According to The Wall Street Journal (via Engadget) Elan is going so far as seeking an injunction against Apple to "prevent it from selling the MacBook, iPhone, and iPod Touch until everything gets legally sorted." What does that mean for Palm? Well, that all depends. If the injunction is successful (unlikely) it could work in Palm's favor. As long as Elan doesn't come after Palm next, that is. Only time will tell.